The aim of this work was to assess the incidence of disseminated pulmonary dendriform ossification in usual interstitial pneumonia and nonspecific interstitial pneumonia, and to correlate thin-section computed tomography (CT) and histopathologic findings. We retrospectively reviewed thin-section CT and pathologic specimens of biopsy-proven usual interstitial pneumonia (75 patients, 57 men and 18 women, mean age 60 years, range 29–83 years) and nonspecific interstitial pneumonia (44 patients, 9 men and 35 women, mean age 55 years, range 20–73 years). 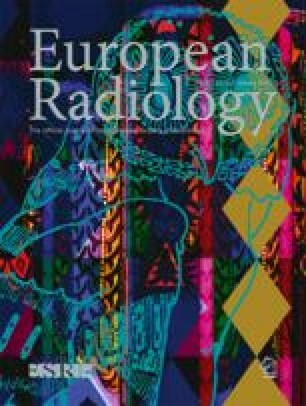 On review of CT and histopathologic specimens, diffuse dendriform ossification was identified in five (four men and one woman, age range 41–68 years, mean 58 years) of 75 patients (6.7%) with usual interstitial pneumonia. It was not seen in any of 44 patients with nonspecific interstitial pneumonia. With thin-section CT (osteoporosis window; window width 818, level 273), disseminated dendriform pulmonary ossification was detected as multiple tiny calcifications in bibasilar subpleural lungs (100% sensitive and 100% specific when compared with histopathologic findings as the gold standard). The thin-section CT finding of multiple tiny calcifications in bibasilar subpleural lungs might be of some help in the differential diagnosis between usual interstitial pneumonia and nonspecific interstitial pneumonia, considering they were not seen in any patients with nonspecific interstitial pneumonia (0%, 0/44) in our series.